The wedding between Kate and Wills is not so much a celebration of the future of our monarchy and the joining in holy matrimony of two young people in love as an opportunity to peddle some 'interesting' memorabilia. Carphone Warehouse and Best Buy have unashamedly hopped aboard the bandwagon with a special edition Royal Wedding mobile phone. In accordance with the quality and prestige as befits the marrying of the Windsor line with the Middleton clan, the handset itself is an Alcatel One Touch candybar handset. Emblazoned on the front is a Union Jack, while the red back features a very, er, beautiful calligraphic rendering of the couple's initials and wedding date. What's more, it comes with Mendelssohn's Wedding March as the ringtone, and the wallpaper is a photo of our balding future King and his bride. 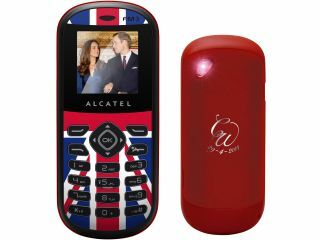 "We are delighted to offer this fun, limited edition, Royal Wedding – themed phone to our customers. It's great to offer a product which really taps into the national spirit over the coming months, and is still an affordable option for customers". Great indeed. Yours for £15 on pay as you go, the handset will be available from Carphone Warehouse and Best Buy. Well, that's TechRadar's wedding gift sorted anyway.